Swarms of flying robots may one day soar into blazing forest fires, cling to undamaged trees, and deploy crucial sensors and tools to track the inferno and its effects. This is the vision of engineers at École Polytechnique Fédérale de Lausanne (EPFL) who have developed small flying robots with insect-like precision and agility. 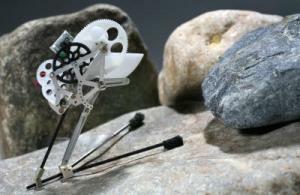 Dr Mirko Kovac and Jürg Markus Germann, from EPFL’s Laboratory of Intelligent Systems, designed the robots with an innovative perching mechanism that allows them to fly head-first into the object, such as a tree, without being destroyed and attach to almost any type of surface using sharp prongs. It then detaches on command. Siobhan Wagner writes that the mechanism works by using two spring-loaded arms fitted with pins that dig into the surface, whether it is wood or concrete. The snapping of the arms creates a forward momentum, allowing for a soft deceleration of the glider, which in turn avoids mechanical damage. Kovac said: “When they want to detach they have a small electric motor and gearbox where it can pull back the arms and be able to retake flight and snap with the same perching mechanism again. The mechanism itself is built in a way that it detects and detaches from the surface by itself. It’s like with your hand, if you push in the middle of your palm the fingers contract automatically. Insects have a similar principle, they have an instinct to close,” he told Wagner. Kovac had previously engineered a grasshopper-inspired jumping robot (see “Grasshopper robot breaks high-jump record,” 22 May 2008 HSNW ). With his latest development, the quarter-gram jumping robot, which can achieve heights of up to 1.37 meters (4.5ft), could now be fitted with the new perching mechanism as well as wings, creating a hybrid creature that gets around much like a flying grasshopper. While the experimental flights demonstrated robots that can travel at a speed of two meters per second, Kovac said it is technically feasible to make them go faster or slower. The ultimate goal of the EPFL team will be to create robots that can travel in swarms over rough terrain to come to the aide of catastrophe victims.